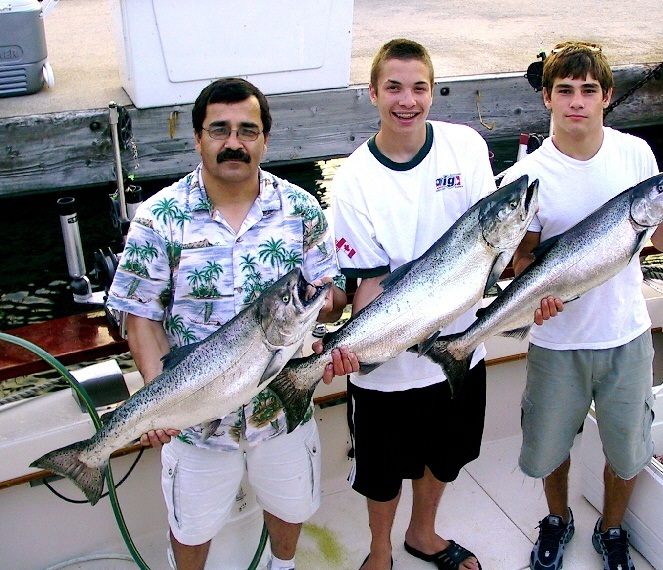 Hooky Charters invites you to experience the best in Lake Michigan Salmon and Trout Fishing. Our 2019 rates are very competitive and include all the equipment necessary for a fun and exciting day on the lake. Fish Illinois just off Waukegan Harbor for Salmon and Trout and you will find some of the finest fighting fish in the world right in Chicago's back yard. We offer the best rates for Chicago fishing charters and Lake Michigan fishing charter services. We accept Visa, MasterCard and Discover cards. We do not accept American Express cards. NOTE: We have a 14 day rescheduling or cancellation policy on all charters. 3 Hour Twilight Fishing After 3 p.m.
All licenses and trout stamps included. Cleaning and icing of your catch. One nights lodging before or after trip (double occupancy). A deposit of $200 is required..
All licenses and salmon stamps included. Call Capt. John for more details. Enjoy your day on the lake. Be sure to use the check list on the home page so you know what you should bring. Rates Page, Chicago Fishing Charters, Lake Michigan fishing charter, Salmon fishing Chicago, Fishing Charter Waukegan, Fishing Charters, Chicago salmon charter, Waukegan Fishing Charter, Chicago fishing charters, Illinois Salmon Fishing, Trout Fishing Illinois, Waukegan Charter Boat, Illinois salmon and trout fishing, Chicago fishing charter, Salmon Fishing, Salmon Charter, Chicago Fishing Charters, Chicago fishing.